Weddings can be expensive, especially if you are trying to do it on a small budget. By the time you are done with the dress, the venue, and the food, there isn't usually much leftover in the budget for decorating the banquet hall. Here are five relatively inexpensive ideas to turn your reception space into something special. White Christmas lights can be attached to the ceiling fixtures and strung to the walls, or hung from the ceiling, like sparkling little stars. They can also be used on buffet tables or to decorate any faux trees the venue might have onsite. Renting fancy seat covers isn't cheap. Buy spools of ribbon from the discount store and tie bows around each of the chairs instead. You can use a color from your bridal party, or pick a glittery white to give it some bling and let your lighting add extra sparkle. You can hang fabric from the ceiling and drape the walls to create a more intimate space. Inexpensive bulk fabric can be found online with a little research, sometimes for not much more than a dollar a yard. It can also be used to cover your tables, and when you've finished using it, you can sell it to the next lucky bride. Fresh flowers, professionally arranged, are pricey. You can create your own stunning arrangements with Styrofoam balls and dried or silk flowers that are usually available at dollar stores. Simply slice a bit off of the ball with a hand saw or bread knife so the ball will sit flat, and cover it in flowers. You can use these to decorate the tables, leaving more money for real flower arrangements for the head table. Just about every kid has done this easy, inexpensive arts and crafts project, and it's a great way to let the children in your life help contribute to the festivities. Simply blow up a balloon, cover in glue-soaked string, and let it dry. Once dry, you pop the balloon, and pull it out. 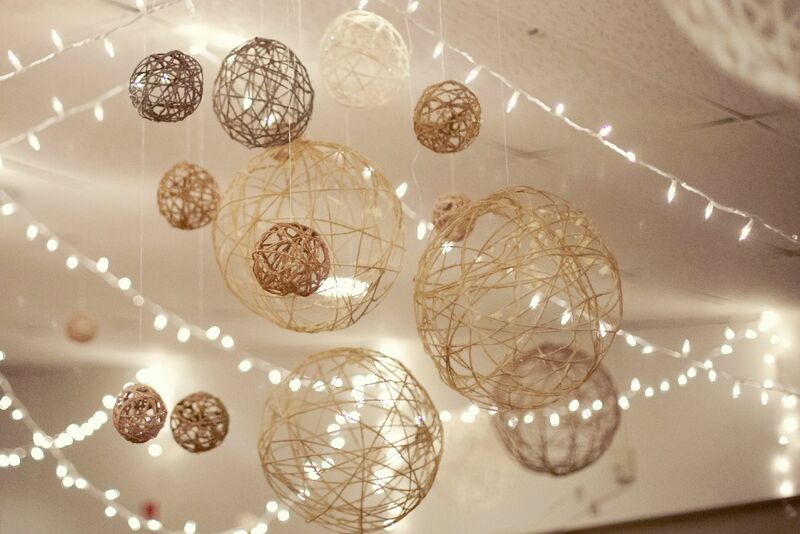 You can leave them the natural color of your string or twine, or you can spray paint in your wedding colors. When hung from the ceiling, you will have a stunning décor feature. With a little effort and crafty know-how, you can transform your banquet room into an inexpensive, spectacular venue.